Lapland Lake Nordic Vacation Center will host a women’s-only ski program Saturday, December 20 from 9:30am – 2:30pm. This new addition to the program line-up, “Introduction to Lapland Ladies Love to Ski”, is geared to first-time and novice skiers only. 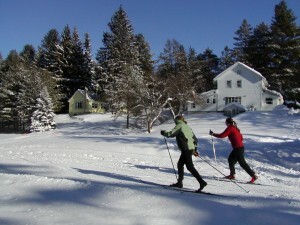 Focus is on classic or traditional cross country ski technique. Cost for the five-hour program is $50 or $78 if participants need rental equipment. Included is a day-long facility use pass, instruction, lunch with equipment & clothing discussion, social group ski with instructors, group wrap-up, hot beverage and equipment discount coupon. The program is led by Lapland Lake’s PSIA-certified instructors Sherry Dixon and Susan Henriksson. Pre-registration is required. “Come learn to classic ski in our supportive, non-competitive environment. This program is taught by women and designed for women,” according to Susan Henriksson. Future programs for novice and intermediate level skiers, who will be grouped by ability, include January 24 and February 21 with focus on classic technique and March 14 with focus on skate ski technique. A complete cross country ski and snowshoe facility in its 37th winter season, Lapland Lake offers fully equipped rental and retail shops, a comfortable two-story warming lodge with snack bar and trailside Tuulen Tupa Grill. The trail system has 50km of trails for all ability levels. 38km are marked, mapped and snowcat groomed with trackset and skating lanes; 12km are ungroomed, marked, mapped snowshoe trails. In addition to cross country skiing and snowshoeing, other resort activities include ice-skating, tubing on two junior hills, wilderness ski touring and visiting with the resort’s resident reindeer! Lodging is available in private rooms and 10 private housekeeping cottages. Lodging packages include use of trails each day and evening including days of arrival and departure, use of the Finnish wood burning sauna and 50% off one regularly scheduled group ski lesson per person. Attractive lodging discounts are offered non-holiday Sunday through Thursday nights. Lapland Lake has been the recipient of numerous awards and honors through the years including this season’s fourth place ranking in North America’s Top 10 Snowshoe Friendly Nordic Centers Snowshoemag.com, Tourism Partner Award by the Fulton County Regional Chamber of Commerce, the Adirondack Regional Tourism Council’s Private Sector Tourism Partnership Award; Best XC Ski Resort in the Mid Atlantic Region and Best XC Ski Resort for Families, Best XC Ski Resort Poll; and Top Ten XC Ski Resort Catering to Families, xc ski resorts.com.